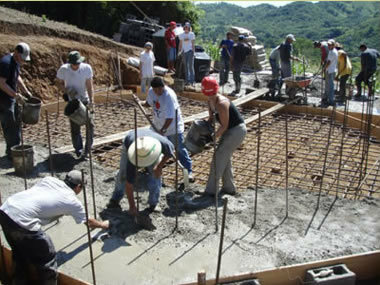 Lehigh's Engineers Without Borders building the foundation for the water tank at Pueblo Nuevo. Lehigh's chapter of Engineers Without Borders is a multidisciplinary group of students dedicated to learning about and tackling issues of global poverty, international development, and sustainability. This group partners with communities worldwide to help implement "sustainable engineering systems that developing communities can own and operate without external assistance, thereby empowering such communities by enhancing local, technical, managerial, and entrepreneurial skills." In 2010, Lehigh's Engineers Without Borders designed, funded, and implemented a small scale water treatment project in Pueblo Nuevo, a village of approximately 1,500 people in northwestern Honduras. Lehigh's chapter has also worked on campus to raise awareness for sustainability, and has educated school children in South Bethlehem on the world water crisis.